When life gets scattered and chaotic things start slipping. We enter survival mode and when we’re in that zone there just isn’t room for extra stuff. We focus on putting one foot in front of the other and making it from one day to the next without things falling down around us. We’re busy trying to figure out where our time went because, gee whiz, I could have sworn it was only 2 in the afternoon, and now it’s 5 and dinner is going to be late. We just simply don’t know where to find the time for the extra stuff – the fun stuff. When we do have some extra time we’re getting caught up on something. The problem is, that extra stuff is really important. It’s what will help keep us sane as we find our footing. It helps us recharge our batteries. So how do we find time for the extra when we’re all ready scattered all over the place? It starts with setting your priorities so you can make time for it. We’ve been working hard all month building our foundation routines. We started by choosing the area in our lives that needed our focus and we identified the three most important things we could do daily in that area. Our goal was to simply get those three things done each day. We did the same things for weekly tasks: Choosing the three most important things we could do on a weekly basis. This is our foundation. It is what keeps us going when life decides to throw us a curve. Now, we need to start looking at what happens next. How to add new things into our schedules and strike a balance between what must do, what we need to do, and what we want to do. We need to set ourselves some boundaries and set realistic expectations for ourselves. Have you ever read or heard Steven Covey’s rocks in a bucket analogy for time management? Here’s a video with a great explanation of what is at the heart of that concept. The analogy is really simple. Our lives are a bucket. The pieces of our lives are rocks, pebbles, or sand. Our rocks are our most important things, the things that matter to us most; family, health, marriage ect… The pebbles are other important things that we need to do, such as work, cleaning the house, etc… and the sand is all the rest. If we start by filling our buckets with sand followed by pebbles, we won’t be able to fit many of our rocks into our buckets. BUT if we start by putting the rocks into the bucket, then the pebbles, then the sand all of it fits. 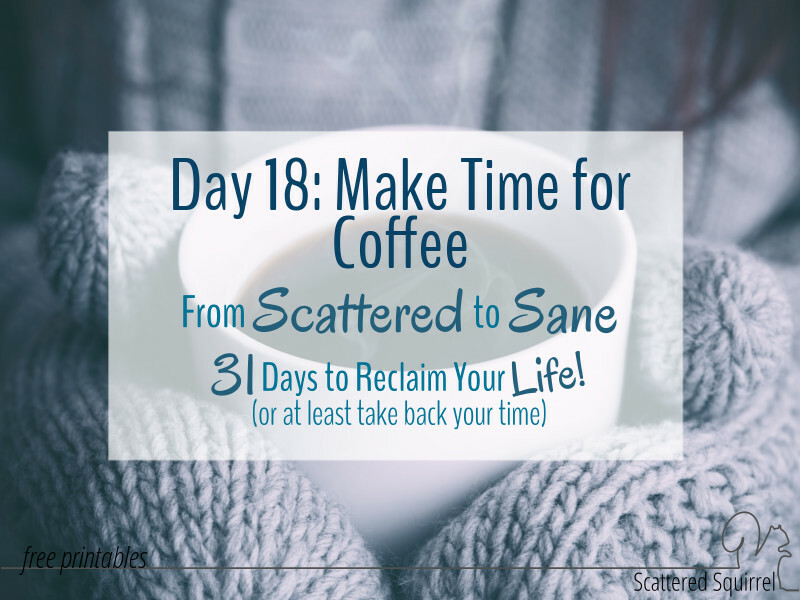 The premise is this – we need to make time for what matters to us most. That way we have time for everything else. If we start by worrying about all the small stuff, we’ll never have enough time to worry about the big important things. Why? Because there is always more small stuff than big. When we’re in a period of our lives where we feel like time is constantly slipping through our fingers, often times what we’ve done (without knowing it) is started filling our buckets with the sand first. We get caught up in the little things. It’s not a bad thing, often I’ve found that it means that my priorities are shifting in some way I didn’t realize. Taking a few minutes to step back and really think about what matters to us most and making sure we make those things our top priority. I do this a little differently than Mr. Covey’s analogy, but the basic idea is the same. My rocks are the things that are most important to me, but they are also things that are a responsibility that I cannot ignore, work and school are two prime examples of responsibilities that cannot be ignored without some very dire consequences. My pebbles are things that need to be done, they’re important or urgent, but not the most important thing. This is the area where my daily and weekly three come from. Yes, it is important that I get those things done, but they don’t come first. My sand is the little things that I can do for myself or those around me. The little side projects around the house that would be nice to get too, but only if I have time. Little things that nurture my soul and that add a little sprinkling of special to each day. I try to pick one thing from my list each day, as a reminder that no matter how full life is, there is always room, even if it’s just 10 minutes for a little something extra. Today, I want you to identify your rocks, pebbles, sand and cup of coffee. Use the printable worksheet below to write them down. There is no right or wrong answers here, only YOU know what matters most to you. The important part is to acknowledge that some things matters more than others. 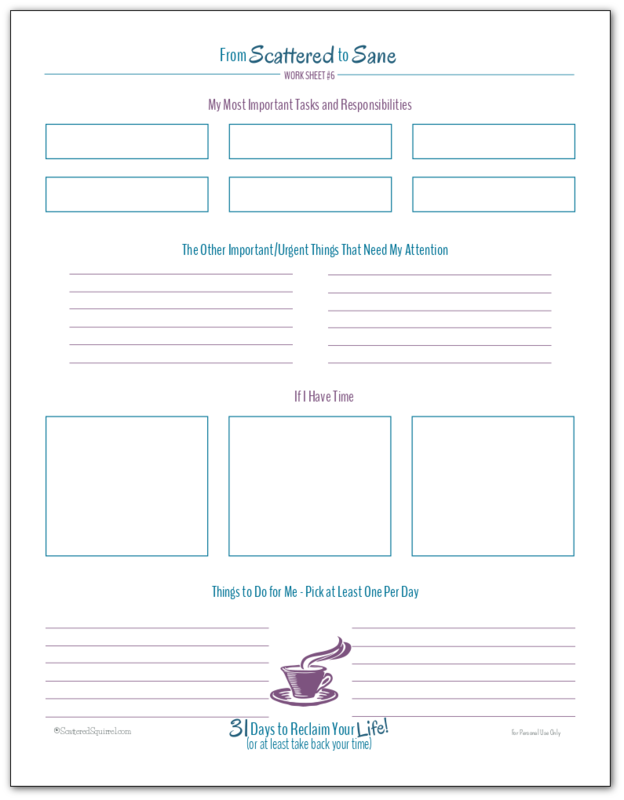 Click the pic of the printable to snag a copy for yourself, grab a cup of coffee (or beverage of choice) and spend some time thinking about this. 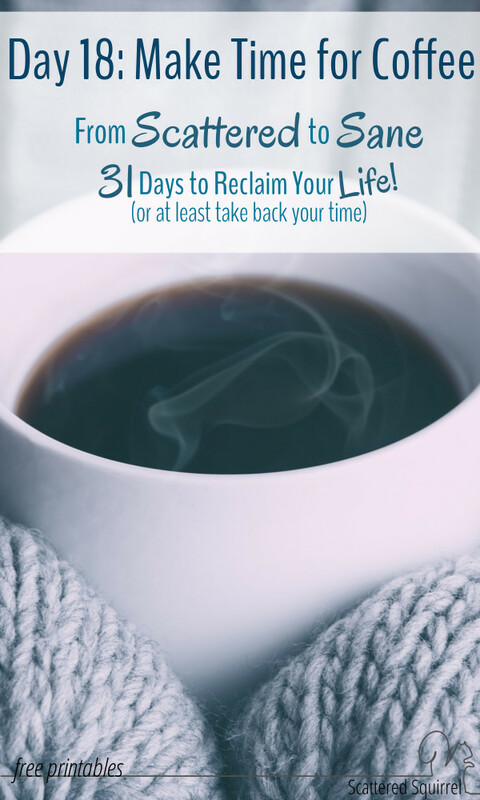 Our next step is going to be figuring out how to use these priorities to help us start reclaiming our lives. This journey from Scattered to Sane is more than half-way done, and it’s time to start trusting our foundation to hold as we begin to build away from it. But for today, just focus on setting your priorities. Inquiring minds want to know – what’s your cup of coffee? Drop a line in the comments below sharing one thing that is something extra you would like to do for yourself each day.